Build a 360-degree entity view using identity resolution software to help you decrease reputational, financial, corporate integrity, and compliance risks with advanced fuzzy matching algorithms. Research reveals that 94% of businesses deal with duplicate records of the same entity and perform identity resolution on some level, either manually or using data quality software. Consolidating related records and tying them to a single entity is inherently complex because exact matches are far and few. Enterprises use 65 applications on average, meaning multiple records for the same entity are spread across. Manual input results in spelling mistakes and formatting issues, resulting in false negatives while matching. Nicknames, abbreviations, and variations provided by customers are mapped as unique data. Identity resolution, also known as entity resolution, is a core data quality process used to identify records that refer to the same entity within or across data sources. This could be done for deduplication and cleansing purposes, or to enrich and create golden records that absorb entity fragments across your business and create a unified entity profile. Match patient data across electronic health records, birth certificate registries, clinical data warehouse, etc. for process improvement. Ensure regulatory compliance with identity resolution software for GDPR compliance and accurate matching against watchlists (OFAC, AML, KYC, etc.). Uncover deep, hidden connections in your data and detect fraudulent entities. For instance, multiple claims from the same address. Confidently identify your customers across omnichannel user experiences by creating unified customer profiles. Identify matches accurately with percent matches between records and setting minimum percent match thresholds by field. Choose which record survives as the ‘master’ by designating the field you want to merge on while storing additional data in a new field. Apply over 300,000 built-in libraries for names (Jon, Jonathan, John), phone numbers, address, and company name for standardization. Integrate with NoSQL and Hadoop-based data lakes, alongside social media, CRMs, traditional databases, and file formats. Organizations today have millions of customer, vendor, and employee records, often with different data standards and non-exact relationships. Performing entity resolution and determining who’s who can be an impossible task without the proper tools. Fuzzy matching algorithms, automated standardization across datasets, and the ability to manually identify relationships are of key importance in your entity resolution software of choice. Data Ladder’s identity/entity resolution products are in place across the Fortune 500 and within government organizations to quickly, affordably, and efficiently enable entity resolution. Merging different databases with different sources (SQL Server, MySQL, Excel, ODBC etc.) and combining into a common structure is the first step in the process. Usually, duplicates are between databases, but sometimes duplicates are within a single table. DataMatch can import, combine, and export to the most common database formats. Additionally, DataMatch will auto-map similar fields from different data sources together (customizable). DataMatch identity resolution software employs fuzzy matching to find duplicates that cannot be detected by normal deduplication methods. Our out-of-the-box reference libraries contain more than 300,000 data standardization rules to automatically correct mistakes, recognize abbreviations, detect alternate spellings, associate nicknames, and much more. When these libraries are used to understand your data, the solution delivers results more accurate than any competing solution. 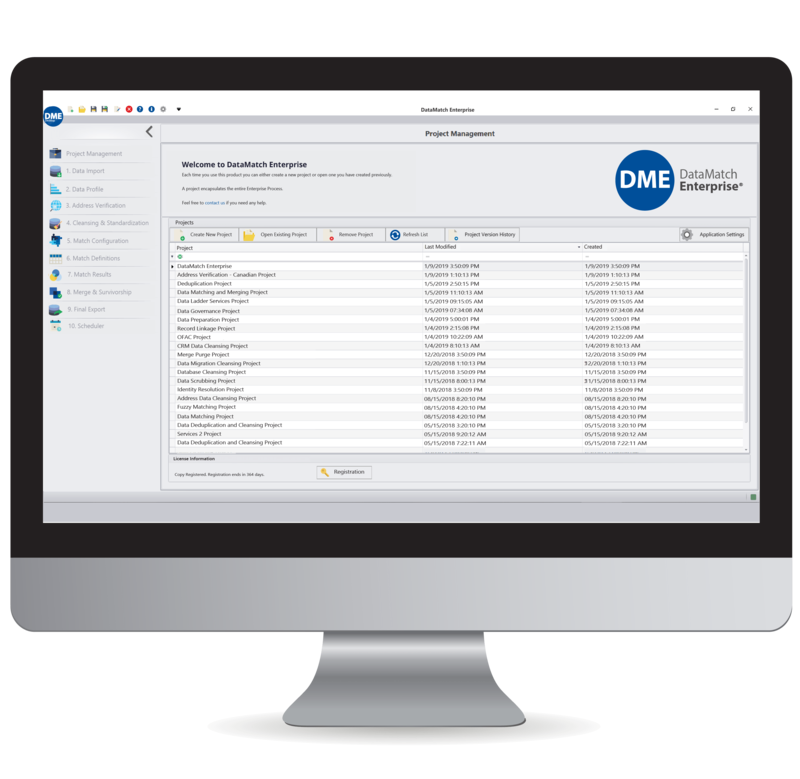 Our identity resolution tool is used for mission-critical applications in a variety of domains by the Fortune 500. Market researchers use it to ensure cleanliness of data. Marketing experts match data from their marketing activities and map it to the right customers. The financial and insurance sectors use it for fraud prevention to detect multiple identity creation and to comply with regulations. The applications are limited only by your imagination. Ready to Start Matching for Entity Resolution?